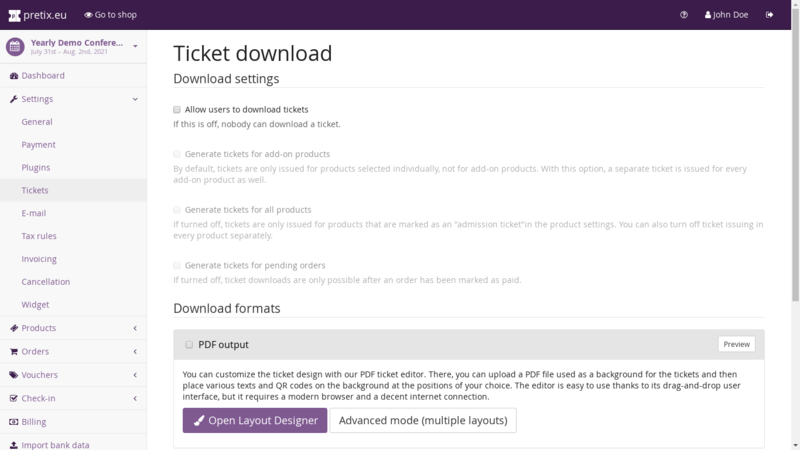 This can be used to completely enable or disable ticket downloads all over your ticket shop. If you set a date here, no ticket download will be offered before this date. If no date is set, tickets can be downloaded immediately after the payment for an order has been received. By default, tickets can not be downloaded for order positions which are only an add-on to other order positions. If you enable this, this behavior will be changed and add-on products will get their own tickets as well. If disabled, you can still print a list of chosen add-ons e.g. on the PDF tickets. By default, tickets will only be generated for products that are marked as admission products. Enable this option to generate tickets for all products instead. By default, ticket download is only possible for paid orders. If you run an event where people usually pay only after the event, you can check this box to enable ticket download even before. Below these settings, the detail settings for the various ticket file formats are offered. They differ from format to format and only share the common “Enable” setting that can be used to turn them on. By default, pretix ships with a PDF output plugin that you can configure through a visual design editor.